The year begins here with grey and rain. Ciwt is glad(ish) for the necessary rain but also happy she doesn't live on the English Coast near Penzance Cornwall where apparently the title of the painting above is also the reality. 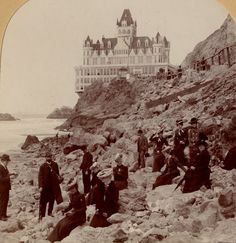 To give it credit, the Penzance Promenade definitely looks to be a more civilized affair than our Cliff House/Ocean Beach Promenade of approximately the same era. Not much fun, either one Ciwt thinks.